We saw a lot of amazing thing in the Amazon. But the walking tree was one of my favorite. It moves about 10cm per year in search of a better spot. Its roots don't really go inside the ground. And you can see which direction it's moving if you look at the roots: the roots on one side are dying while it's growing new roots on the other side. 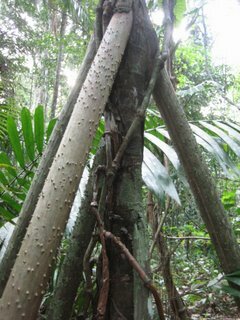 There was another related tree called the balancing tree. This tree doesn't move, but it can change its angle. I love seeing what evolution does. Did they happen to mention if it was walking away from the sound of chainsaws...? 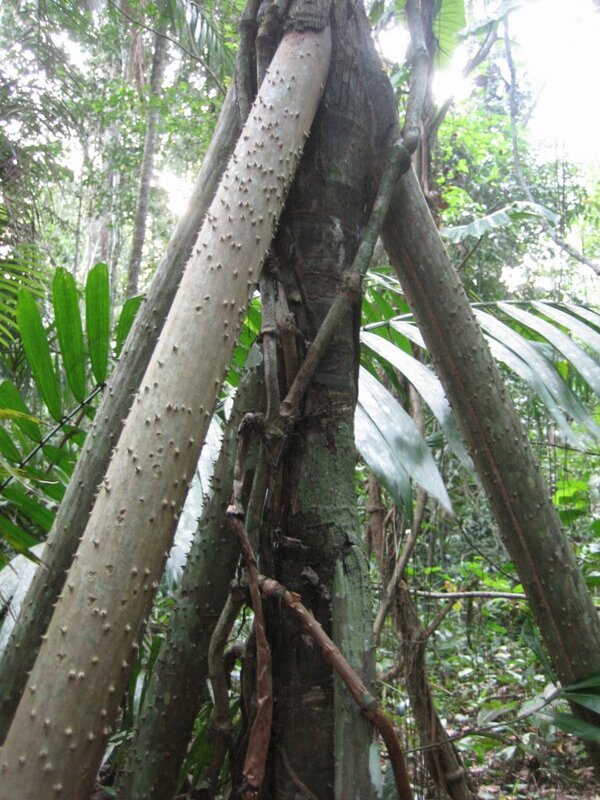 Those are some cool pics from the Amazon, especially the walking tree. The creations from Allah are indeed amazing at times and spectacular to see. But all to remind us He is here. Right? Am looking forward to seeing more of ur adventures bro. -Amina from MN. That's AMAZING!!! It's so facinating that there are such things in the world. Someday (while it is still there) I hope to visit the Amazon. Thanks so much for sharing! Awesome!!. I wonder how many things are undiscovered yet. greetings from Chile! Hi! I would like to stablish communication with you by e-mail, if possible. 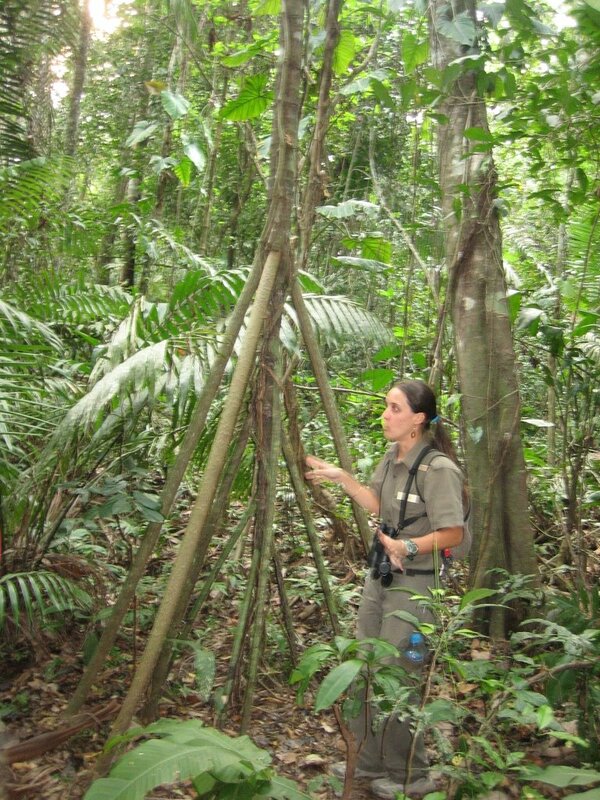 I´ve worked in the Amazon Forest and I respect and love it very much. Can we talk? Looks like an awesome adventure! Wow! Nice pics!! And ur trip looked really adventerous. But,i differ something on evolution which u mentioned. Is there any trace how it might have evolved? For me its wonderful meeting a googler. Hello, nice to meet to you . That's amazing ,and wonderful blog. I hope I go to Amazon. I introduce News from the world,making by bloger . If you agree, Can I introduce your Blog ? it was really good to go thru your blog..........i didnt know that trees can walk too till i read your post.really great.can i add you up in my FELLOW BLOGGER'S LIST??????? So glad ro stumble across your blog and look forward to reading it. Hey,Man its realy wonderful.But how is the Ecosystem? still a virgin Environment or due to the impact of man it is shrinking to a Big Hyde park?hehehe.I like ur Weblog and would like to be in contact with you . Wow! I never knew about walking trees. That is fascinating. You are right--evolution is cool. Thats one cool tree! It looks awesome in the Amazon. If you like this blog you might enjoy http://carolandacupoftea.blogspot.com. Its so funny! In Mexico there are no walking trees. At least I don't know of them. But there are sinking houses. what is tenth story may be ninth story in a year, 8th story, in two years and so one. That is because the soil is clayey that keeps getting pressed and squeezing water out. an in Arizona Ancient Trees have become Metamorphic rocks over millions of years because the wood grains have been washed out by floods and filled by sand. World is a wonderful place to live. Great Amazon pics. My son & I will be traveling to the Amazon region of Brazil, the Xingu and smaller tributaries this Nov. I've been there before, beautiful place with beautiful people. I got back from Ecuador a little less than a year ago, and the walking palm was by far my favorite tree. Thanks for bringing back the memories! Hmnn, we could learn a lot from this tree. Sometimes, I think we latch on to where we are for too long, so long that we don't ever find out if there's a great spot someplace else. Congratulation for being a "Blog of Note"
I, for one, welcome our new walking tree overlords. I like your comment Michelle... that is so true. I have always wanted to go to the Amazon Forest, for now I'll have to settle for posts and stories of other people's travel there! Congrats.....being a good blooger thanks for the some cool amazon pics.. I'd heard about walking trees, but I'd never seen a picture. Those straight roots aren't what I'd expected. Thank you for sharing these pictures. I agree with the above comment. Give all glory to God the Sovereign Creator. Don't insult Him by giving credit to the tree. He gave that tree permission to move, just like He told the ocean how far it could go, and the sun, moon and stars exactly where they are to be. I am awed by trees, because they remind me how awesome God is! Hi, I saw ur pics, it's really simply super. really a very nice trip! i liked a lot reading your interesting post, thank you very much for writing it!